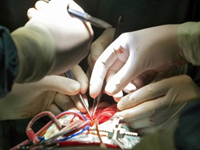 Omsk heart surgeons saved a patient’s life by implanting an artificial left ventricle into his heart. It is now powered by an electronic battery. The man, who hadn’t even been able to walk before the operation, is now ready to lead an active life. Today he was discharged from the hospital. The heart surgeons gave the patient the last instructions before discharging. The main module is in its place, the batteries are charged, and the heart works without missing a beat. Now, after a unique surgery, Sergey Ryabov remembers – his “motor” is in constant motion while it’s powered, so the fully charged back-up batteries must always be ready. “My second heart won’t work without them. If I have to take a long walk and I know it’s going to take a lot of time, I’m just changing the batteries so I don’t have to worry about them”, Sergey Ryabov says. The surgeons tell us that they have used artificial blood-circulating systems for treating the heart pathologies before, but those were imported, cumbersome, and costly: over 10 million rubles. The work of Russian designers and engineers was used for the first time. Omsk became the third city, after Moscow and Novosibirsk, where the Russian “artificial heart” was installed to a patient. The patient has a serious case of heart failure. His left ventricle fails to do its work and pump the needed amount of blood to the aorta. The doctors implanted an artificial pump into the ventricle, and it is this pump that makes the heart work. This Russian “artificial heart” is almost three times cheaper than the imported ones, and it’s easier for the patient to wear it. The whole system weighs about three kilograms. A person can remove the device from the waist before the sleep, the more important thing being not to disconnect the batteries from the pump. The device was given to the Omsk clinic through the “hi-tech medical help” government program, so the surgery was free of charge for the patient. “The man can now be in any place for up to 12 hours; he’s not a prisoner of his bed or his apartment anymore. He can take any means of transport now: train, car, or plane, and before the surgery he practically couldn’t walk”, said Valery Tsekhanovich, the head heart surgeon of the Omsk region. The surgeons of the cardiac center collaborated to implant the artificial ventricle to the patient. Now, Sergey Ryabov is going to be under the medical surveillance of the doctors, who are certain that such operations in some cases of heart failure can become an alternative to heart transplantation.